The iconic turn of the Colorado River known as Horseshoe Bend is easy enough to get to. 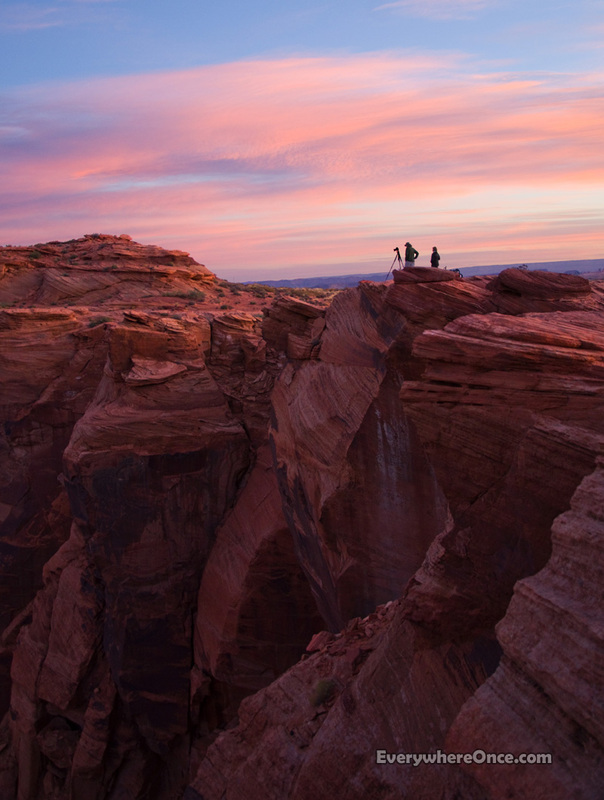 From Page, AZ, it’s a short five mile drive from town followed by a half mile hike over a small sand dune. Actually seeing Horseshoe Bend is another matter. 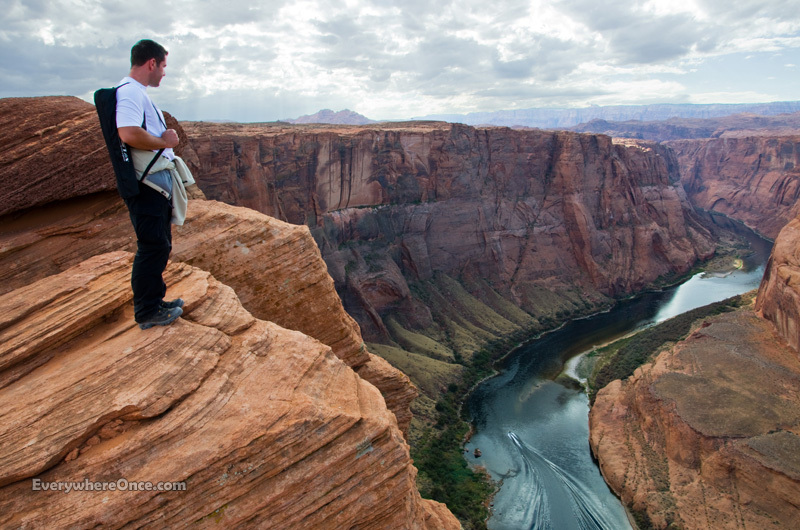 If you’re used to viewing natural wonders from a “safe distance,” Horseshoe Bend isn’t for you. There isn’t a safe distance from which it is viewable. To see the river and the full majesty of the bend, you have to sidle right up to the edge of a roughly 1,000 foot cliff and look down. It would be worth it, to get images like this! For those of us without a great head for heights, it’s a jolly good thing we have you! OMG that first photo is GORGEOUS! I noticed my height anxiety kick in a little when going up a parking garage the other night; thanks for doing this for me. As always beautiful shots, Brian. Ye gads!! That makes me think of an overlook of the coastline of Kauai — it was terrifying but spectacular! THANKS for sharing!!! Beautiful! Definitely worth the risk! Thanks for sharing. Incredible photo and view. I have been to the edge of the Grand Canyon, but their was a protective barrier as I recall. Not as photogenic, but I felt much more secure. Thanks for sharing. What a stunning place…excellent photos. Wow! The photos are amazing and so tempt me to want to do it, although I would so need to face my fear first. Ooh! This made my hands sweat! Gorgeous. This is one of my bucket list areas to shoot 🙂 Enjoyed this post…thanks for sharing. This place never ceases to awe and inspire me!! I don’t think I would be able to stand so close to the edge. But a belly crawl would be worth the view. by different terms which describe the same thing. which is generally at 11:30 a.
efgorts and I will bee waiting ffor your next post thanks once again.